Quanta CBD Oil Review | 2019 Update! Thinking about testing the “CBD waters?” Find out about an up-and-coming brand in this complete Quanta CBD oil review! No matter how you look at it, the popularity of cannabis is skyrocketing – the main reason being for its potential medical properties. Currently, 33 states across the US have legalized cannabis for medicinal use. Moreover, cannabis that is predominantly made of hemp is legal in all states, and most of the world, for that matter. On average, marijuana plants contain 10-25% THC (the psychoactive compound responsible for making users high) and very little CBD — often less than 1%. Hemp plants, on the other hand, can contain high amounts of CBD and only small traces of THC (between 0.3 – 1.5%). This is why hemp has quickly become just as popular as its “better brother,” marijuana, because CBD is gaining a lot of awareness for its incredible therapeutic benefits for both the body and mind. And the best part? Products made from hemp are completely legal in the US, and are legal to be shipped to all 50 states. This has led to the formation of multiple CBD-based companies, one of which is Quanta CBD. In this complete Quanta CBD oil review, we will be taking a closer look at the brand as well as the products they offer, and whether or not we think they stack up against some of the best names in the industry. Quanta CBD is a Los Angeles based biotech firm who focuses on the development and commercialization of innovations that use Quantum mechanics in biochemistry. They share their patented technology with high-powered, high-quality brands in the fields of supplements, vitamins, cannabis, and phytochemicals through their “Powered by Quanta” co-branding program. Cannabinoids have traditionally entered into the body with low levels of bio-energy. The reason that consumers have unpredictable experiences with cannabis, which can make them paranoid, anxious, or tired, is said to be because of this shortage of energy. Quanta CBD technology works by recharging targeted elements and aligns the electron spin to produce a chemical reaction in the body that is more efficient and helps to increase the intended results. Eric Rice is the CEO of Quanta CBD, and he has stated that the cannabis industry is in need of innovations that remove many of the roadblocks to legitimacy, which includes the well-known unpredictable experience of one user to the next. Polarized cannabis is their solution to this problem. It’s pretty much the opposite of what we typically think of when it comes to the effects of cannabis. We realize that this may all sound a little confusing, so let’s break it down a little more simply. Essentially, Quanta CBD oil produces products that are focused on delivering the cleanest and most efficient pain relief for your body. Their main product is muscle rub, and the unique thing about this company is that they use their own technology to make their products. 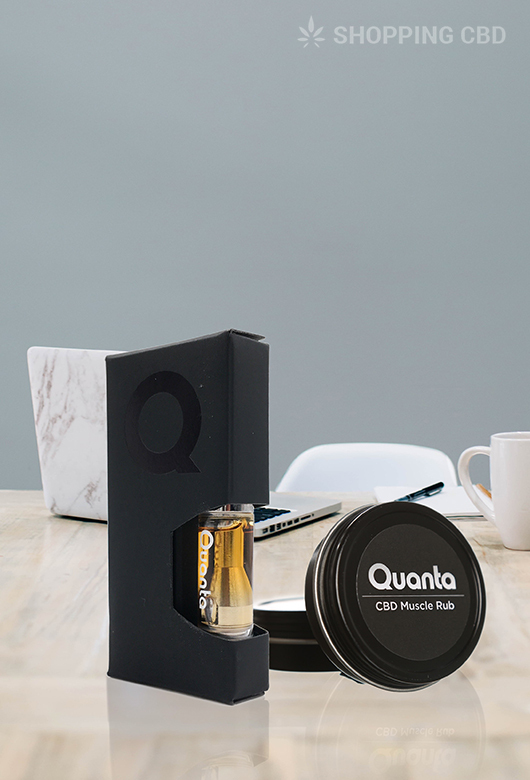 The biggest highlight of Quanta CBD is undoubtedly the unique and innovative technology that is used to create their products. This company is working to bring on a new frontier of medicine, where naturally-occurring remedies and elements are just as powerful – possibly even more so – than pharmaceutical drugs. 100% natural products: Quanta CBD products are made from 100% organic hemp CBD, and contain no THC. 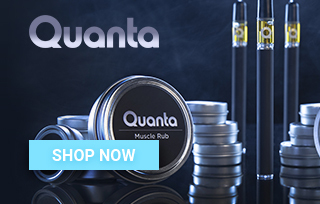 Free standard shipping: Quanta CBD offers free shipping when you spend $75 or more. If you are a regular customer, then this can go a long way in saving you quite a few bucks in the long-term. Customer service: The company is known for their great customer support and have fast response times. There is a contact number, email address and contact form on the website to submit any queries or questions that you may have. Testimonials: Quanta CBD has a testimonials section on their site which has a number of video testimonial from satisfied consumers who have achieved great results using their products. This is the first time that we’ve come across a whole selection of video testimonials for any brand. It’s great for anyone who might be a little unsure about a product or wants to find out more about the effects. Blog: The website has a blog section where they address various topics, like what Quanta’s natural ingredients are, how to use their products for muscle recovery, interesting facts about the brand, and lots more. It’s a great source of reference for curious consumers. We love the innovation and ideas behind Quanta CBD and their products, which is why we are rather disappointed that they don’t offer more. They have an exceptionally small product selection — in fact, they only sell CBD muscle rub, albeit in a few different variations. The good news is that we can only assume that over time, the brand will continue to add more products to their collection – especially if things go well with the current collection. But for now, they have a very specific product that is for very specific needs. As we mentioned above, there are not a lot of products to choose from with Quanta CBD. Online we found quite a few mentions of vape pens, but we couldn’t find any actual devices for sale on their site. So we are not sure if they used to sell vape pens but no longer do, or if they’re listed somewhere else on the site that we somehow missed. 75 mg CBD Muscle Rub: This is a highly popular topical that is 100% natural and contains organically grown hemp and no THC. The main ingredients used are Organic Hemp Seed oil, Organic Beeswax, and Organic Sunflower Oil. 150 mg CBD Muscle Rub: This muscle rub is exactly the same, except it’s stronger since it contains a higher dosage of CBD. Muscle Rub Plus: The only difference with this muscle rub appears to be that it contains nano-sized arnica. This is particularly helpful for muscle and joint pains. There is 150 mg of CBD in the product. 75 mg CBD Muscle Rub: This is sold for $25. 150 mg CBD Muscle Rub: The 150 mg CBD rub is sold individually for $45. However, you can purchase two in a value pack for $79 – an $11 saving, or you can purchase a 5-pack for $199 which means savings of $26. Overall, it seems as though Quanta CBD is a very reputable company that offers high-quality hemp-based products. We love that they use a completely unique and innovative technology to try and create the best products possible, as there are not many other CBD companies out there who can claim to use their own patented technology. Additionally, we found their products to be pretty reasonably priced overall. For anyone who is dealing with muscle aches, anxiety, or stress, Quanta CBD may very well be a worthy investment — just don’t expect it to out-and-out cure all of your problems all at once. 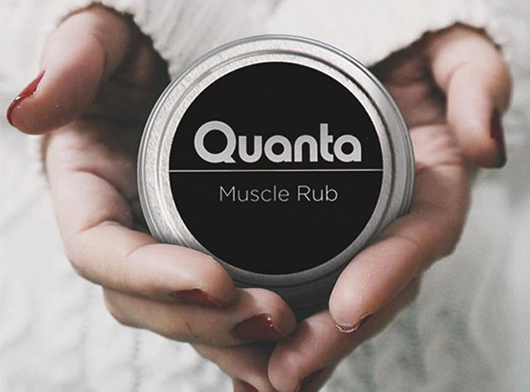 Quanta Muscle Rub has been essential for my recovery after a long day of training in the pool - super pleased with the numbing effect it has on the ache. Kaia from Ashburn just bough! Crystal from Ashburn just bough! Alejandro from Ashburn just bough!